Ashkenazy Acquisition Corp. has signed a contract to buy Avalon Chrystie Place for just under $400 million. 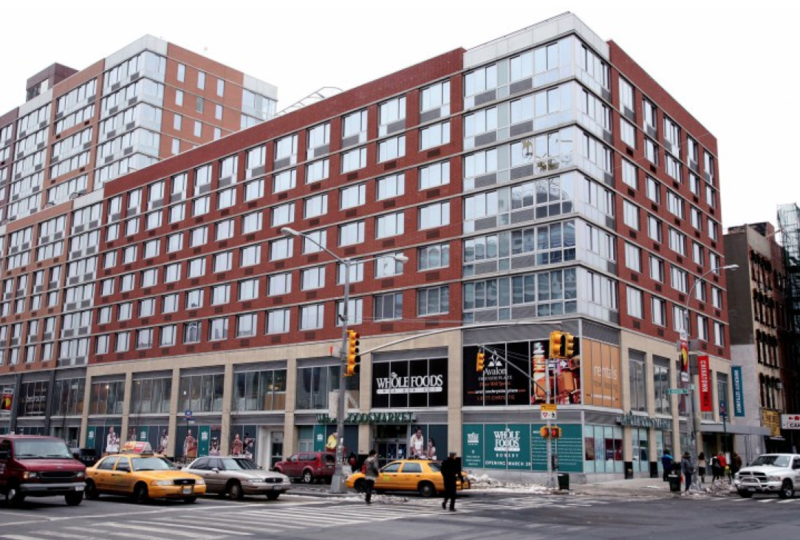 We’ve learned the active acquirers, led by Ben Ashkenazy and Michael Alpert, are the winners of the sought-after retail and apartment complex at Houston and The Bowery that includes Whole Foods. Andrew Scandalios, an investment broker with HFF, handled the sales process that began in January. The seller is an investment group led by the real estate investment trust Avalon Bay Communities. Designed by Arquitectonica and completed in 2005, the 361-unit 80/20 project at 229 Chrystie St. is 95 percent occupied, with 72 of those apartments paying affordable rents. But sources said both the market-rate units and the 72,300 square-foot Whole Foods lease — which ends in 2028 — are now paying below market rents, and will thus provide ongoing rolling upside. The only two apartments for rent, for instance, are an alcove studio with a separate kitchen for more than $3,000 and a two-bedroom for $6,000 per month. The project was initially developed as a result of AvalonBay and an institutional partner, along with Phipps Houses and retail consultant Williams Jackson Ewing, winning a request for proposals from the city to buy the land. Developed over 1.33 acres, the tower of the 14-story building is one of the highest in the area and has views to downtown. It includes a fitness center and roof deck as well as a billiards room and other amenities, including the use of a pool. The pool was developed as part of the deal with the city. It is located in a $14 million-plus, 42,000 square-foot multilevel underground ‘Y’ that also has a fitness center and gym, meeting rooms and a dance studio. As the Y, retail and residential portions are already divided into separate condominiums, the sale attracted many bidders with different exit strategies. This is the first foray into the apartment market for Ashkenazy, as it has until now concentrated on retail and office buildings such as the operating office leasehold at 635 Madison and the land under 625 Madison, as well as the Barney’s retail at 600 Madison. Ashkenazy has also purchased the retail at 1311 Lexington Ave. and in the base of 200 Central Park South. Ashkenazy and HFF did not return requests for comment and an AvalonBay spokesman declined to comment on any possible transaction.